Earlier this week I finally got around to setting up a Thorn Tree Forums account. I know, right? And I call myself a traveler. Anyway, the reason I’m bringing it up is because as I was attempting to give my profile a little personality, the “Favorite Places” question stumped me. Before I backspaced my initial answer and instead went with the cliché, “too many to count” response, I had first written Porto, Portugal. 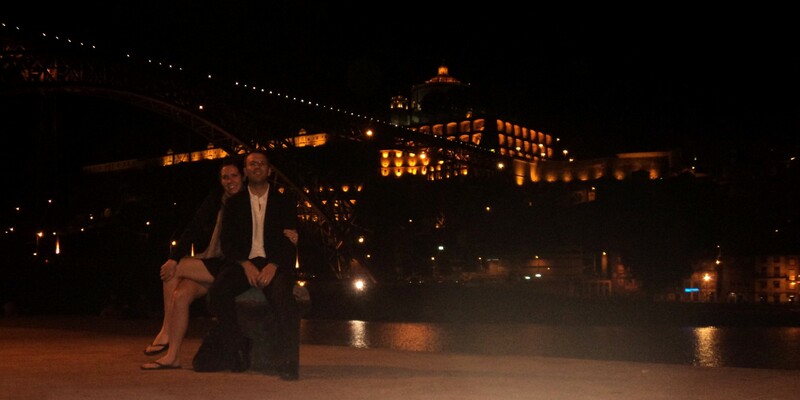 Andy and I went to Porto in 2011. The old travel adage of ‘keep your expectations low and your sense of adventure high’ is advice that really pays off when you stumble upon somewhere great but didn’t know it would be. Porto is such a place. Go there now. So I guess this might not apply to your trip… but for us it was true. 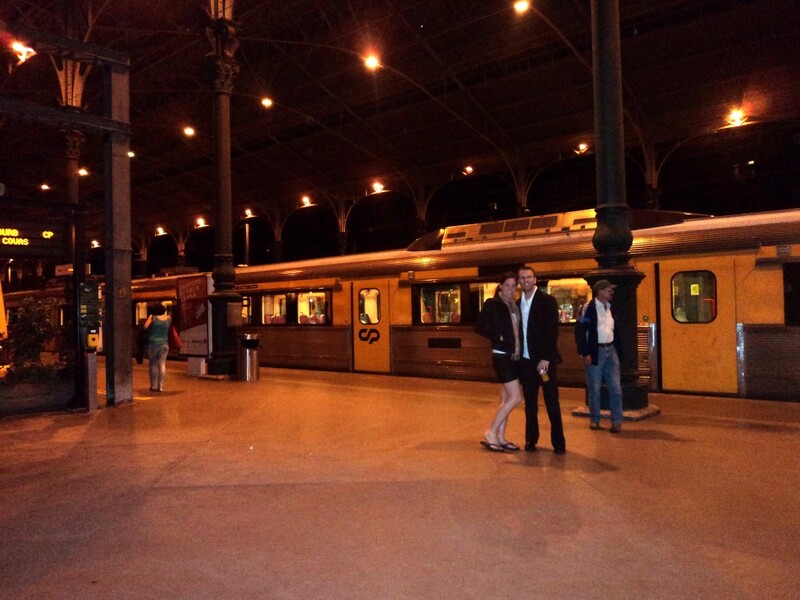 While the train from Lisbon should have cost €70 each, because of a strike, we rode for free. This all sounds nice and simple, but it was actually extremely difficult to understand in Portuguese. Even after taking our seats, I kept expecting a conductor to come by, publicly humiliate us and stick us with a hefty fine. None came though and saving €140 definitely gives you a nice first impression of a city. 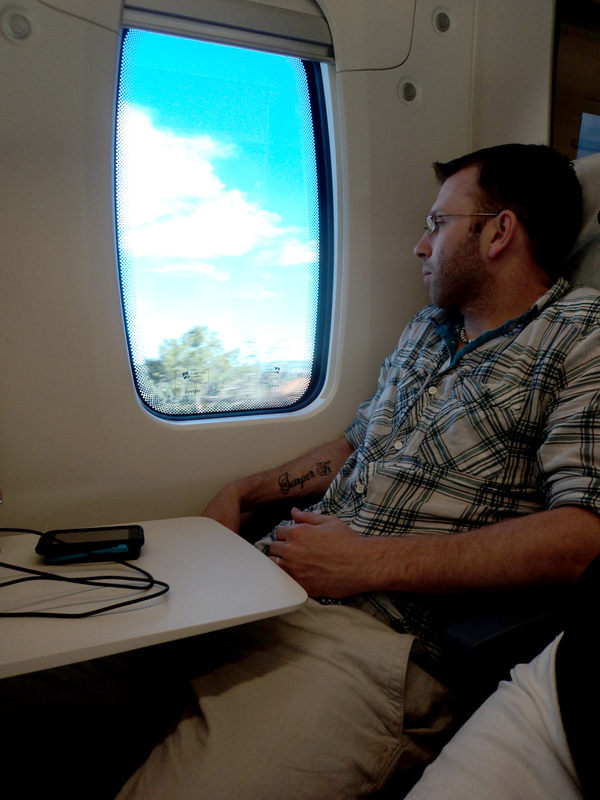 Here’s Andy on a train. I actually think this photo was taken a few days later on our way to Avila, Spain… but it still seems to be a relevant enough visual for this post. 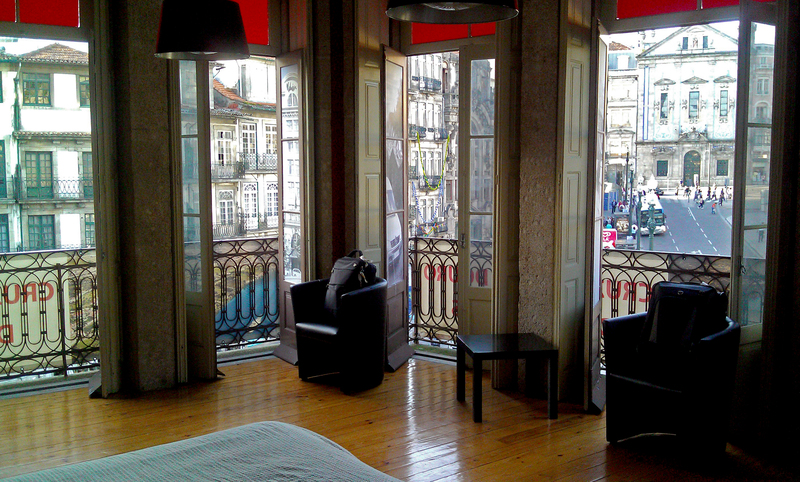 In Porto, the booking stars aligned for us. It wasn’t a resort or anything but our hotel was dirt cheap and it was magical. I almost hate to tell you the name of the place because the pictures you can find online aren’t that great and if anyone goes there someday and tries to replicate our experience it just might not work. There’s more balcony than wall! But for us, on those two late spring nights, we were young, in love and crazy about our hotel find. The sun was shining, the city was bustling and the breeze was blowing through our million Juliet balconies. Okay, so it was only twelve balconies – but seriously, who gets twelve balconies? In the morning we awoke surrounded on three sides by lovely European architecture and enjoyed the sound of the traffic below that reminded us of home. It simply could not have been any better. Our view. Does it even need a caption? If you really want to know the name of the place, you can read my review here. Also, those are my photos in the review gallery and that’s me kicking my feet up and relaxing. Seriously. Google it. Here’s a video I took from a rabelo on a river tour in which I remain oddly silent. I can just never get the balance between talking too much and remaining eerily silent during home videos. Portugal, as a whole, is a bit more affordable than a lot of Western Europe and Porto even more so. Had we known this going in we might not have been so stinkin’ charmed by how little everything cost, but we hadn’t had a clue. 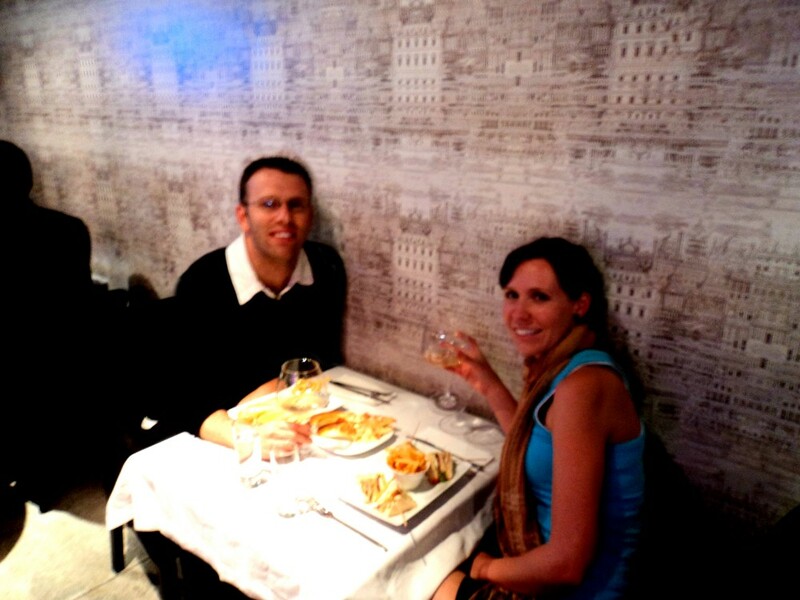 On our first night we splurged on a dinner out (partially because we’d saved €140 getting there and partially because it was evening and heaven forbid a grocery store stay open in Europe past sundown). Our food and wine were indeed cheap but the real holy-crap-look-at-these-prices moment came the next night. The things you have to endure because of a lack of 24-hour establishments. Am I right? The next night, we were sitting along the waterfront watching the lights on the river when, inevitably, Andy had to pee. When Andy has to go there is absolutely no waiting around for a more convenient time or place; he may have Superman’s immune system, but he has the bladder of a mouse (and not a mouse of the mighty variety). The charming little restaurants and bars right on the waterfront were inviting but if I’ve learned anything from pretty little places it’s that they’re overpriced tourist traps. Still, Andy had to go so we ducked into one and decided we could squeeze two overpriced beers out of our budget. As Andy headed to the WC, I ordered our libations, and because there were no listed drink prices, I didn’t know how much to give the waiter when he returned with our cervejas. I pulled out my change and handed him a €1 coin while I dug around for more. He promptly stopped me and wouldn’t accept anything else. Yes folks. 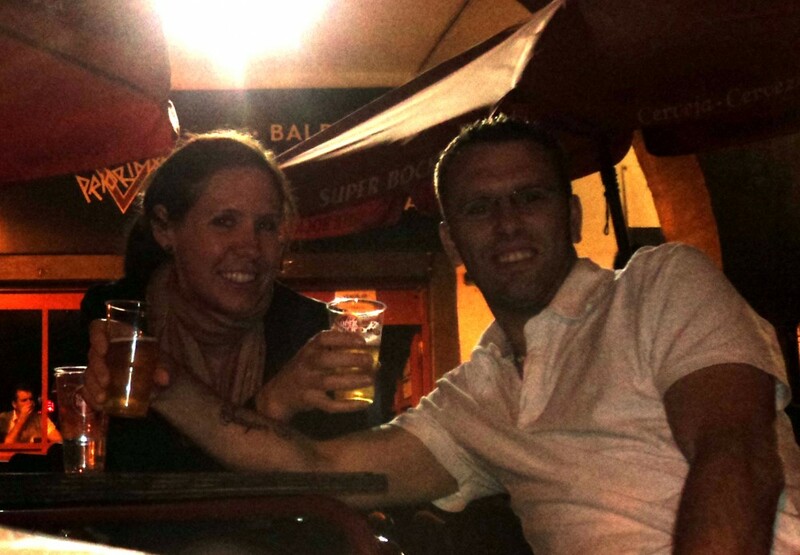 We had stumbled upon 50 euro cent beers with a million dollar view. Needless to say, we stayed and had a few more. Since I didn’t have my actual camera that night and only my phone, I didn’t get any amazing photos. If you click here and you’ll see what I’m talking about though – absolutely stunning. Because it’s always good to learn about where you are, we took a tour of Croft, one of the port cellars and found it to be delightful. Just like true champagne is from the Champagne region of France, true port wine is from the Douro Valley near Porto. Tours are aplenty, informative and come with free samples of their goods. The cellars are lined up along the Gaia side of the river and illuminate the sky with their giant neon signs that somehow complement the surrounding Old World charm and come across as enchanting instead of what you might usually think a neon sign to be. 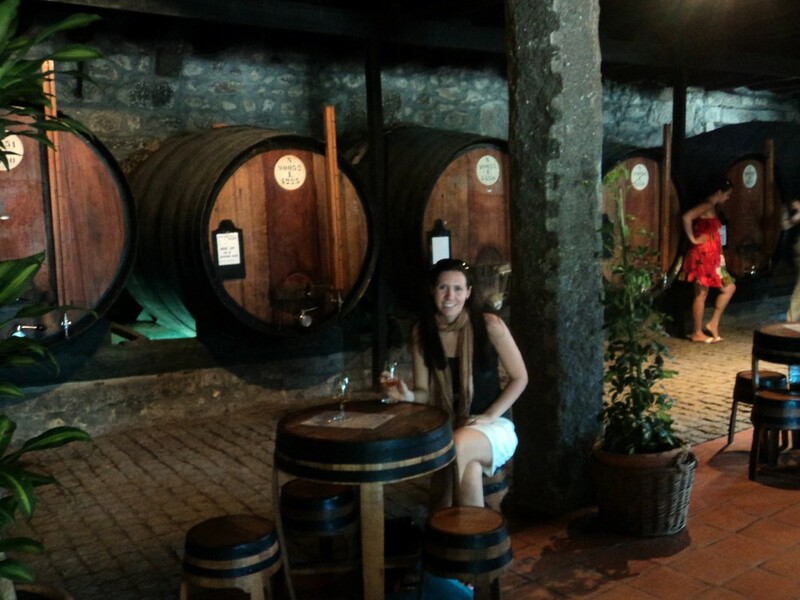 Sampling port wine after our tour. And that, my dear readers, is why I love Porto. 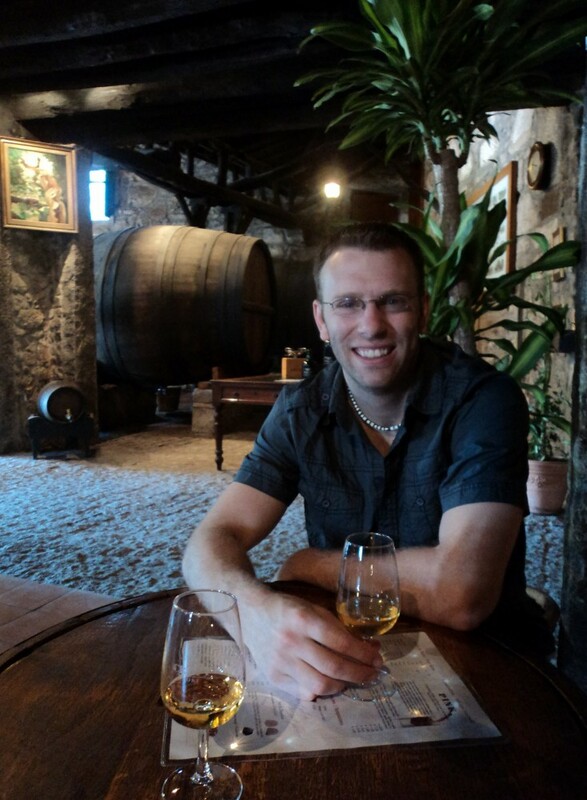 And because no one wants to read a blog that is rooted in the clouds, I’ll throw in a little reality: Porto is really steep, it lacks public restrooms and truth be told, while the tour was cool, port wine left me less than impressed – it was way too sweet and syrupy. There. We wouldn’t want Porto getting a big head or anything. 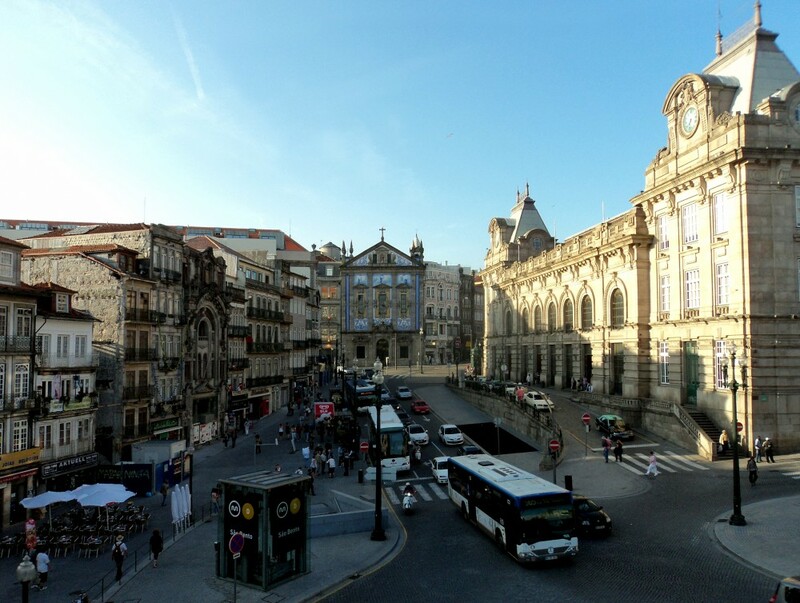 So while I can’t guarantee you’ll get a free train trip without consequences, if you should find yourself in Northern Portugal, stop by Porto and enjoy a fabulous little city. Maybe it seemed so great because we knew nothing of the place ahead of time and therefore maintained managed expectations. Maybe it was because Andy and I are absurdly easy to please when it comes to lodging. Or, maybe we just got lucky and did things like order beer in a wine town and stumbled upon the always-appreciated reverse sticker-shock. 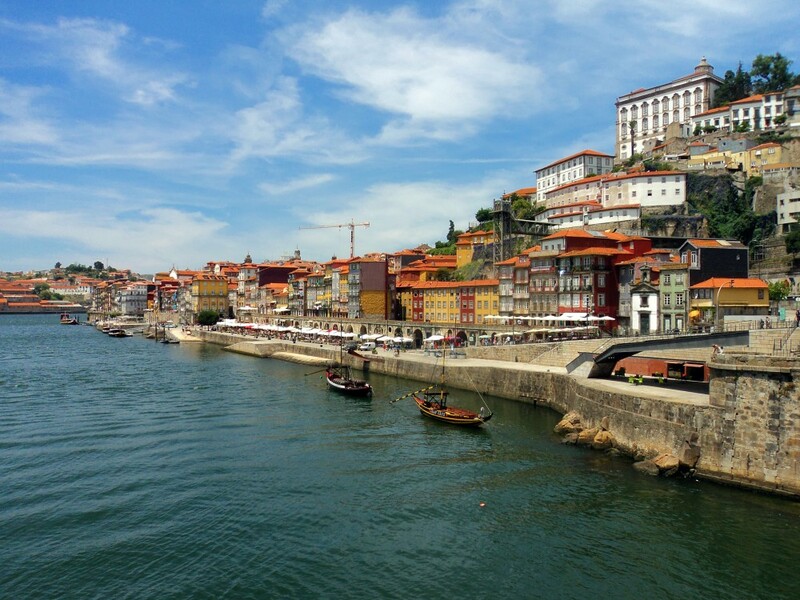 Whatever it was, I’d love to repeat it because Porto was definitely one for the books the blog. Andy, actually enjoying his beverage. At the São Bento Raiway Station where we’d popped in to check out the magnificent azulejo tile panels that depict the history of Portugal.